Hello and welcome to this week's Midweek Throwdown challenge! Are you having fun with a challenge a day this month?! We’d like to thank everyone who entered into last weeks Halloween challenge. How fun is was to travel around seeing everyone’s spooktacular creations, a big thank you to everyone who played along! Our challenge this week is a Fall Themed Thank You! We challenge you to make Thank You cards with a fall theme for our hero’s to send home to their loved ones! Our card sample this week was made by me, Jan. My plans for our sample didn’t work out as planned. Hopefully I can introduce you to the extremely talented young lady I had in mind at a future challenge! To see more of my cards please visit my blog She’s Gone Stampin’. I love your copic colouring Jan, and the flower on this card is lovely! Please contact me at linnie@aboverubies.co.za. My personal e-mail had failed me. So glad this challenge came up - and reminded me of the special envies I had saved for halloween hero mail! 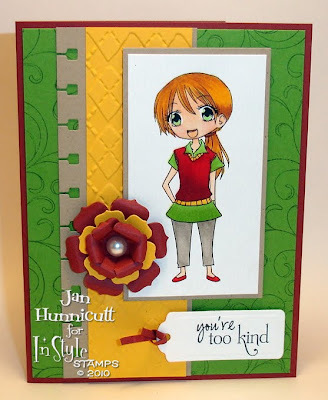 Gorgeous card Jan...and fun challenge!